When Uranium was discovered in 1789, it was named after the new planet Uranus, found in 1781. No further elements beyond Uranium were discovered until after Pluto's appearance. Uranium was the ninety-second element in the Periodic Table of elements, and when the next two elements in this sequence turned up, elements 93 and 94, there was a kind of inevitability about their naming. They had to be named after the next two planets, and so were called neptunium and plutonium - both found at Berkeley using the new cyclotron. Glen Seaborg who named the new element had (it hardly needs saying) no inkling of the awful symbolic appropriateness of the name he was giving. He would have guessed it would be fissile, that's about all. Water: in nitric acid baths, the spent reactor fuel is dissolved and thereby the plutonium is separated out - and given to the military (2). The 'plutonium economy' is one of stealth and secrecy, as may remind us of the way in which "Hades was never depicted in ancient Greek art, more out of awe than because of the problems of showing an invisible ruler" (3). The problem of who had what plutonium was an exciting government secret, labyrinthine in its deceptions. Pluto's domain gained its ‘plutocratic’ wealth from minerals, especially precious stones and metals, underground: advocates of a plutonium economy foresaw an era of cheap energy that would ensue from using it. The trouble was that a mere microgram (millionth of a gram) can kill, if lodged in the lungs. The dream (or nightmare) of plutonium-based reactors, called 'fast-breeder' reactors, seems to have died, around 'Pluto's turning-point' of 1989, due to world uranium costs dropping. There was a definite moment, when the endeavour to create a sample of plutonium began: in Berkeley, California, Glen Seaborg switched on the beam of the big cyclotron onto a sample of uranium. Seaborg's diaries give us the exact moment of this event. (4) The previous summer neptunium had been made, and Seaborg's team decided to have a go for element 94. A beam of deuterium was focussed upon a uranium sample from 8.00 hours until midnight, on December 14th, 1940 (5). The chart for this moment has Pluto rising within half a degree. Sun, Moon and Earth are aligned (at Full-Moon) with the Galactic Centre at 27° of Sagittarius. That's our local black hole, (or, maybe its a white hole - let's not be dogmatic here), which could be symbolically quite appropriate. Also in line is Seaborg's own Pluto, i.e. its position when he was born, at 27° of Gemini. The Plutonium-creation chart is bristling with pentagram-symmetries which astrologers call 'quintiles'. There was a Jupiter-Saturn conjunction chiming and Pluto was square to this, and also it was in quintile (72°) to Uranus. That quintile between Pluto and Uranus met and re-met altogether five times (due to the retrograde motions), and Plutonium was created at the last of these five quintiles. The Moon was on the midpoint of this aspect, i.e., in a decile (36°) aspect to them, and right on the position of Seaborg's natal Pluto (within 5'). Thus Pluto had moved a decile (36°) since Seaborg was born. Plutonium has five different crystal-type conditions or 'phases' that it can be in, and has five possible valencies (6). These are abnormal and surely unique properties for a metal. In addition it seemed to me that it could exist as five possible isotopes that were important, though others were also feasible. Its markedly fivefold character was expressed by the pentagram-geometry in the heavens at its birth. I found and published the chart for plutonium in 1984, then more recently in 2000 its striking connection to the earlier chart for Pluto's appearance was noticed (7). The 'ascendent' of the plutonium chart was four-and-a-half degrees of Leo, i.e., this was the degree rising when the cyclotron beam was switched on, and Pluto was then at four degrees of Leo. When Pluto was discovered a decade earlier (by Clyde Tombaugh at Flagstaff, Arizona, at 4.00 am on Feb 18th, 1930), the ascendent at Flagstaff was three-and-a-half degrees of Leo: the genesis-moment for plutonium had Pluto rising and on the ascendent degree of its own discovery! Such synchronicity rules out the possibility of chance, and indicates that the new metal is in some sense ruled by the new planet. Also, Taylor noticed, a straight line between Berkeley, where the new element was made, and Trinity where the first plutonium device was exploded, passes right through Flagstaff in Arizona. 1. Allen Ginsberg, Plutonian Ode, 1982 City Lights Books San Fr. 2. In Canada, nuclear reactors have remained unlinked to any military program. 3. K.McLeish, ‘Myth,’ 1996 Bloomsbury p.236. 4. The Plutonium Story, The Journals of Professor Glen T. Seaborg 1939-46, Ohio 1994, p.14. 5. N.K., Pluto and Plutonium 'The Astrological journal', Autumn 1984 p.4. I obtained the relevant page of his then-unpublished diaries via a letter from Seaborg. The genesis-moment is 4.00 am GMT on Dec 15th 1940. 6. Plutonium 'undergoes no less than five phase transitions between room temperature and its melting-point.' Also its ions are commonly 'in the III, IV,V & VI oxidation states, but also VII': J.Katz and G.Seaborg, Chemistry of the Actinide elements 1957 p.265. 7. 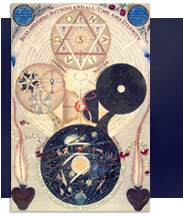 Brian Taylor, The discovery of Pluto in: Orpheus, Voices in contemporary Astrology Ed S.Harvey 2000 247-330.